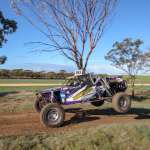 Alan Dixon and Jonothan O'Connor have taken out the 2018 Victorian Off Road Championship. 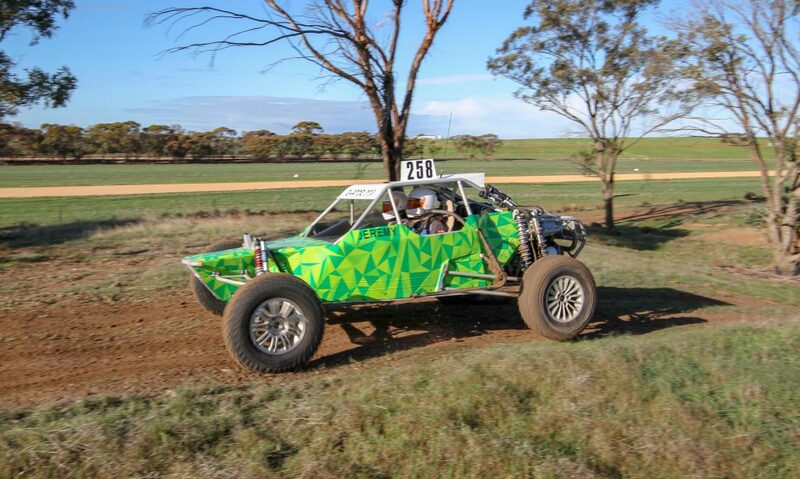 Moneybox Racing’s Alan Dixon and Johnny O’Connor finished the Hindmarsh Shire Rainbow Desert Enduro with no shortage of silverware – the pair claiming the Australian Prolite Class Championship and storming home to take out the Victorian Off Road Championship (VORC). It was an unlikely win for duo, the Moneybox Racing team experiencing a difficult round one at Bagshot in July where they were classed as a finisher but languishing at the rear of the VORC field. Saturday’s prologue saw Victorian point’s leader Eric Schlifelner in his extremely quick Saber Prolite leading the Victorian field and good enough for sixth outright, Dixon ninth outright and second in the VORC, while David Davis was third fastest in 14th outright. Schlifelner in action before his Victorian title hopes were dashed. Schlifelner and Dixon both had another shot at the prologue course in the Top Ten Shootout but neither could improve on their time. Schlifelner got the jump at the start of Saturday afternoon’s two-lap section but his race was shortlived when he hit a jump hard just five kilometres in, a damaged wheel ending his race and state championship hopes. Dixon took over the lead for the title and stayed there for the remainder of the section, crossing the line in 11th outright. 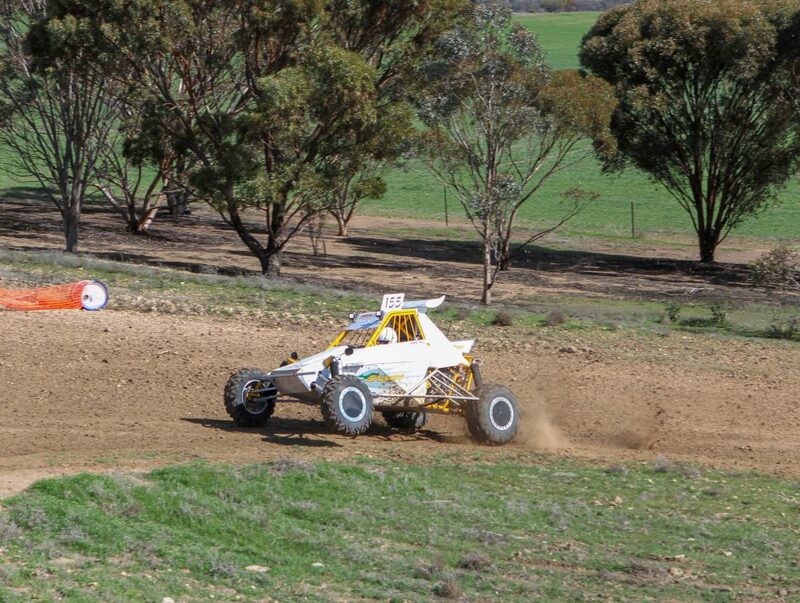 Ken Holt was the next VORC contender, driving his Super 1650 Buggy to 15th outright, and Craig Button rounded out the top three in his Extreme 2WD. Day one was looking positive for Nigel and Brock Pendlebury before a DNF ended their campaign. Nigel Pendlebury and David Davis had their 2018 VORC hopes dashed on Saturday – Pendlebury retired his Super 1650 Buggy at the end of day one’s race due to second gear issues and Davis failed to complete the two laps due to tyre issues. Sunday saw sunshine and a three-horse race as Dixon led the contenders into the desert closely followed by Holt and Button not far behind him. Dixon, with the Australian Prolite title also in his grasp if he could finish the five-lap race, produced a smart drive. A conservative drive from the normally flamboyant Dixon saw him complete a trouble-free run in 3:47 minutes. Second was the Super 1650 of Ken and Jeremey Holt with a total time of 4:45 minutes and rounding out the podium was Craig and Adam Button with a time of 5:56. Ken and Jeremy Holt on their way to a state second place finish. With all three drivers equal on 140 points after the two races, a count back delivered the 2018 CAMS Victorian Off Road Championship to Dixon, with Ken Holt runner-up and Craig Button in third.